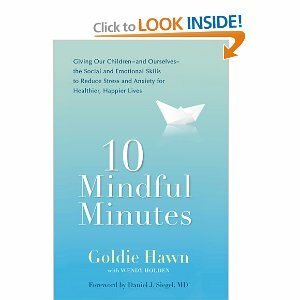 Check out the new mindfulness book from Goldie Hawn, 10 Mindful Minutes, (http://www.amazon.com/Mindful-Minutes-Children—Ourselves—Emotional/dp/039953606X/ref=sr_1_1?ie=UTF8&qid=1335817284&sr=8-1). This book does a nice job of explaining mindfulness, new brain science research, and ways to incorporate this information into your parenting life. She provides mindfulness activities for exercising the senses and activating gratitude, optimism and happiness. Diving deeper at times, she weaves tiny ideas as to how daily events, such as listening to the radio, can be used to draw attention into the present moment, bringing mindfulness practice effortlessly into life as you already know it. Light, playful, and inspiring reflections from Goldie’s own experiences are delightfully sprinkled throughout the book, making it an enjoyable, feel-good read. For additional information on Mind Up, the signature educational initiative offered by the Hawn Foundation, please visit: http://www.thehawnfoundation.org/mindup. So great- i had just ordered this book the other day and it came in today. I’m looking forward to devouring it. Thanks for the review.